Abstract: We're excited to see what the Gigabyte GA-890FXA-UD7 motherboard is capable of with a 6-core Phenom II X6 1090T chip locked into its AM3 socket....but this article is all about a first look at everything Gigabyte's squeezed in. Part of the charm of AMD processors is the platform itself. Case in point; I was chatting with a colleague recently who asked my opinion on a new PC system for his home (what's better, AMD or Intel?). A tricky question at the best of times, but the answer I gave wasn't at all what he expected. Instead of a long winded string of technobable about what's faster or has more cores, or how Intel or AMD processors perform in benchmarks.... I suggested he should first consider what the computer is going to be used for. Answer that and you'll quickly know what kind of CPU to aim towards and how little, or much you have to spend on the computer. Both AMD and Intel make processors that are better in one way or another for certain kinds of tasks, but to a significant degree the platform should also be considered. There's no need to rehash the capabilities of AMDs 890GX chipset here, but that's one good example of how an inexpensive chip and an affordable motherboard can come together to make a good home theatre or media PC in a snap. And so it is with the fresh crop of AMD 890FX motherboards - respite with 'new motherboard smell'! If you want to run dual ATI Radeon graphics cards teamed up in Crossfire for pure speed, speedy widescreen gaming, or speedy multiscreen gaming, the 890FX is the best chipset in town because it has plenty of PCI Express lanes to go around. 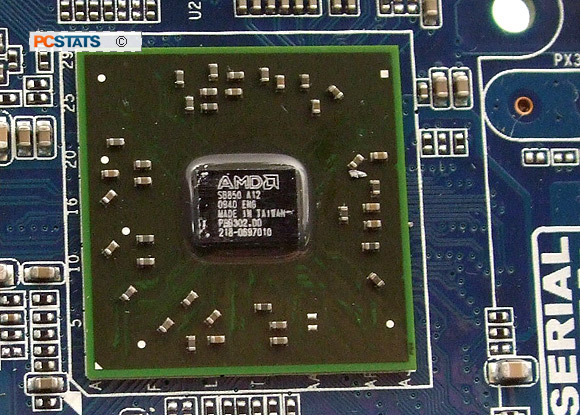 We're excited to see what the Gigabyte GA-890FXA-UD7 motherboard is capable of with a 6-core Phenom II X6 1090T chip locked into its AM3 socket....but this article is all about a first look at everything Gigabyte's squeezed in. Enthusiasts will want to take notice of the Port 80 card, illuminated power/reset/CMOS-clear buttons, dual slot spacing for four-way Crossfire of PCI Express x16 videocards and combination Nothbridge waterblock/heatpipe silent thermal solution! The focus of this preview is to give you a taste of what you can expect from Gigabyte's latest flagship motherboard, if you want to know more there'll be a full review shortly. Let's begin! 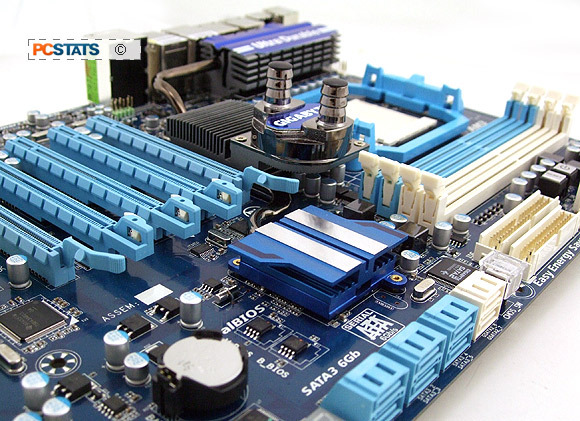 Gigabyte pack many interesting features into the GA-890FXA-UD7 motherboard, including a special PCB with 2oz. copper substrate, Japanese solid state capacitor, several different energy saving features and... AMD core unlocking. Certain AMD chips are sold with workable cores in a locked status, so essentially a quad-core CPU is sold as a triple-core, and so forth. Gigabyte created a tool called Auto Unlock in its EasyTune6 software package that can enable a processors hidden yet working cores, if there are any. 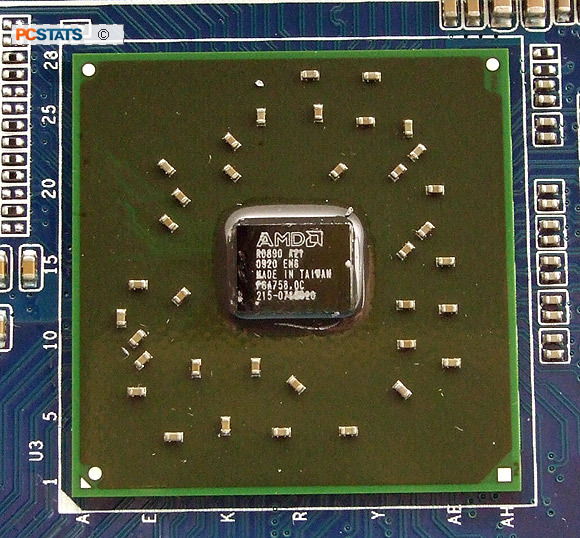 This varies with each chip and only certain models (say... Phenom II X2 540), but never the less the potential is there! Do your research before buying a specific CPU model, but keep in mind it's still luck of the draw. Gigabyte's GA-890FXA-UD7 motherboard supports 6-core AMD Phenom processors in its AM3 socket, and is built around the AMD 890FX and SB850 chipsets. That means native 6Gb/s SATA III and lots of PCI Express bandwidth for multi-videocard set ups. The board comes with two PCI Express 2.0 x16 videocard slots that run with 16-lanes of bandwidth each, two PCI Express 2.0 x16 slots that offer 8-lanes of bandwidth and two others that offer PCI Express x4 respectively. Dual, three-way and four-way Crossfire is easily accommodated on this motherboard, and critically all the videocard slots are double-spaced! 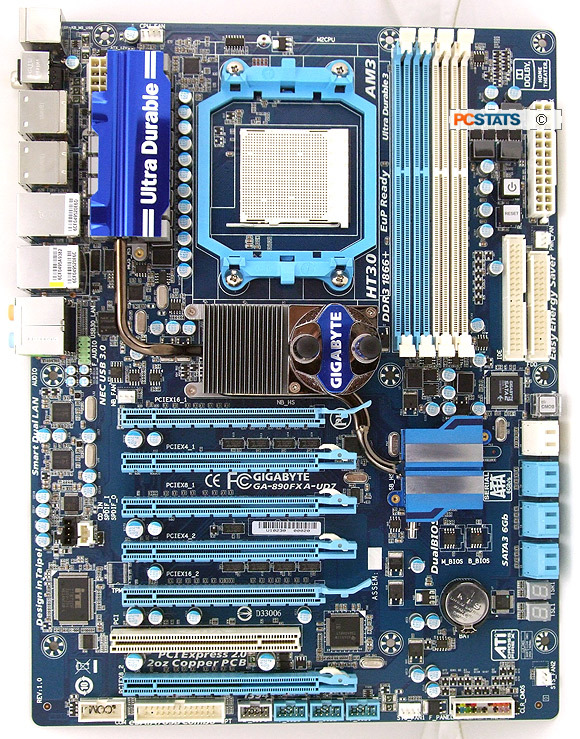 Gigabyte's GA-890FXA-UD7 board has four dual channel DDR3-1066/1333 memory slots which can accommodate up to 4GB of DDR3 RAM. Memory can be overclocked to run at DDR3-1866 speeds with compatible modules. In terms of data storage the GA-890FXA-UD7 is well equipped - six native 6Gb/s SATA III ports off the AMD SB850 chipset and two 3Gb/s SATA II connectors, all with at least RAID 0/1 support. Pair that up with two eSATA jacks on the back and well... it's future-storage-proof. Rounding out the features are (2) USB3.0 ports, (14) USB 2.0 ports, (3) Firewire and a pair of Gigabit network jacks that can be teamed for additional network bandwidth. High Definition 8-channel audio comes standard. The USB 3.0 ports have a dedicated PCI Express x1 connection via the 890FX. Gigabyte has put much effort into energy efficient features, and in testing PCSTATS has seen positive although small results from its Dynamic Energy Saver tools. The board uses an 8+2 phase power supply and special Japanese made capacitors and MOSFETs to (theoretically) improve its longevity - generally known as 'Ultra Durable 3' by the manufacturer. Gigabyte '333' is a set of technologies that include USB2.0/3.0 slots capable of outputting higher voltages to power external hard drives, 4.8Gb/s USB 3.0 ports for high speed peripherals care of the brand new NEC PD720200 controller and 6GB/s SATA III connections via Marvell's SE9128 for quicker hard drive transfers. The '333' name comes from USB3.0, SATA 3 and 3x USB Power. Now on with the preview!